MPI Home Video issued this 1985 film to video in the 80s. 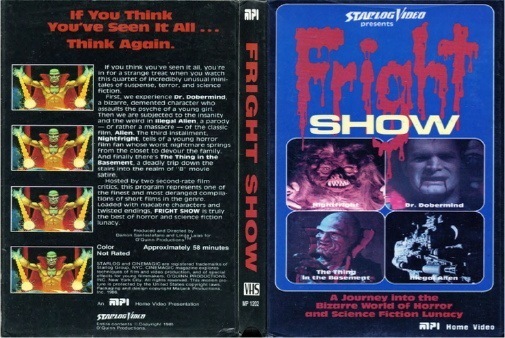 Directed by Linda Laias and Damon Santostefano (and also known as FRIGHT SHOW), this is a funny compilation of lighthearted kids horror and sci-fi. The first segment (DR. DOBERMIND) is about a little girl touring a taxidermy museum and being haunted by the creepy tour-guide; the second takes place in outer space and is a parody of Alien (ILLEGAL ALIEN); the third is about a little boy who joins a big kids horror club and is haunted by visions of a monster but no one will believe him (NIGHTFRIGHT); and the last story is about some poker-playing geeks who get a meteor through their house that carries an unfriendly visitor. (THE THING IN THE BASEMENT). In between each of these films is in-studio cable-access-styled commentary by two dorks who work for "Starlog" Magazine. All four science fiction films were winners in the CINEMAGIC magazine contest way back in the early 80's. The full title is "CINEMAGIC: A JOURNEY INTO THE BIZARRE WORLD OF HORROR AND SCI-FI"